Three months on from the last update and there is progress. A few quids worth of silicon hoses arrived from various suppliers mid July that should be sufficient for creating a bolt together solution. One thing missing was some hose joiners and this is where my DIY mentality came in. You can get 32mm alloy diameter aerial masts quite cheaply and these make great hose joiners but they need a bead. 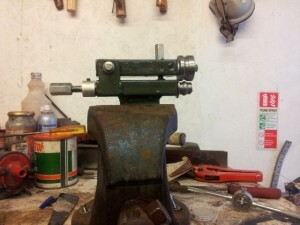 Bead formers run to several hundred pounds so seeing as I have a lathe I knocked one up using bits of steel lying in the shed. The end result is a bead former that is adequate for occasional use. 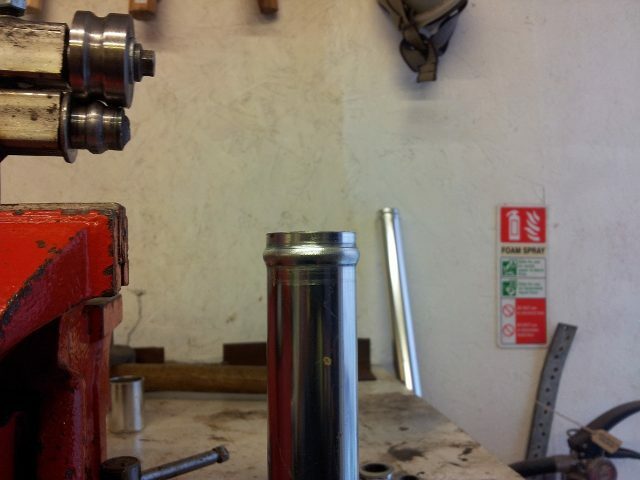 The roller is turned using a socket wrench and a spanner is used to apply the pressure in stages. It takes between 4 and 6 revolutions to get a nice bead and works fine for the limited use I’ll put it to. And here is the first bead I made – before painting the bead former for the sharp eyed ones out there. 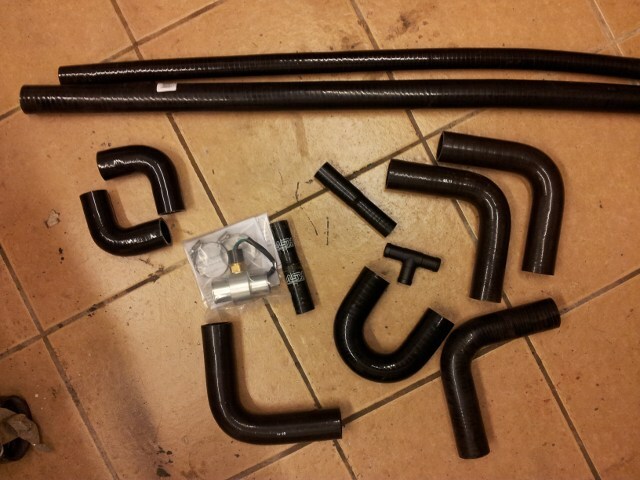 The hoses could now be cut and joined up to proved a cooling system and were loosely fitted into place. Next up was the fuel system and the fuel tank was bolted into place. This did require the boot floor to be “raised” with the aid of a hammer above the sender to clear the connector but it went in ok. The 8mm and 6mm hard fuel lines took several evenings of work to shape and fix in place and then another evening later the fuel pump and fuel filter was bolted to the rear bulkhead. Turning attention to the front end it was time to start final assembly of the engine area. A quick stop at Screwfix for some hose clips and I picked up 10 in each size I was likely to use. These weren’t their cheap range so I expected them to be good but they snapped before they were reasonably tight. The Terry clips I’d used before worked fine so a quick online order and I had 60 Terry clips and they worked out the same cost per clip as the Screwfix ones. I really must stop buying own branded junk and stick with the known brand names. 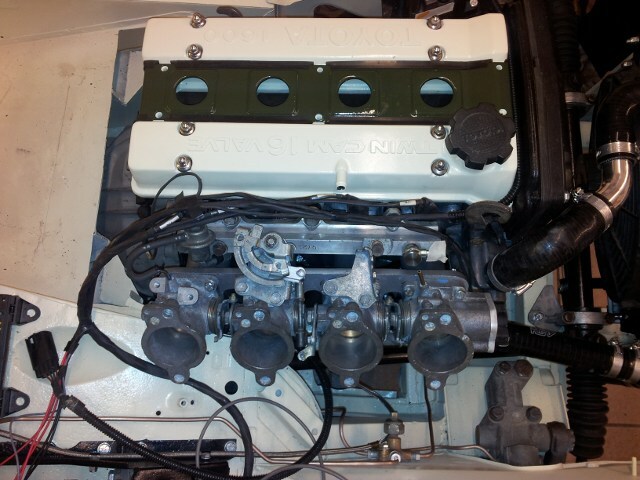 So today the hoses were fitted followed by the final fitting of the inlet manifold and throttle bodies. The fuel injectors had new seals fitted and it all just bolted together nicely. Next up is the remote oil filter then some more cabling to get things started.